Some pictures to start off showing some of the different blade types which the Wilkinson company offered during the Victorian and subsequent eras. In the third and fourth photos, a "Claymore" type as used on Scottish broadswords. This is the single-fuller version (some had two) and is on a Cameron Highlanders sword. 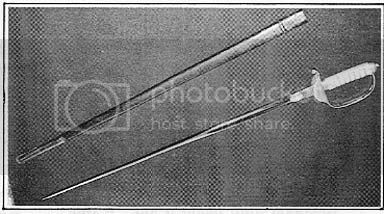 In the last photo, a "Paget" type (similar to the 1796 LC, though smaller, or to the Mountain Artillery sword). This is a 1917 Indian Army example. Last edited by John Hart; 06-07-2010 at 07:23 AM. Going on to look at some of the less common blade types, my starter (first and second photos) is this 36", double-fullered blade made to special order for an officer in the 11th Hussars in 1900. It's a Wilkinson, but to my mind resembles the French Cuirassier sword of a much earlier date - the proof book entry describes it as "Special Cavalry - G Grip". The third and fourth photos are of an 1860-dated patent hilt sword, made originally to the regimental pattern of the 15th Light Dragoons (with appropriate battle honours), but later rehilted to HC pattern when its owner joined the 2nd Dragoon Guards. I don't know if there is a Wilkinson term for this type of blade, as unfortunately there is no proof book entry for the sword, but it reminds me of much earlier (1780s/90s) patterns with that thin single fuller close to the back edge of the blade. I have seen only one Wilkinson Triangular bladed Military sword and this was a Rifle Volunteer Officers sword with steel hilt, Sword was number 18989 from 1873. Initials TL etched on the shoulder of the blade. Blade was 32 1/2 x 5/8 in special triangular shaped steel scabbard. It is now part of the collection of a well known collector based in South Africa. I have this remnant of a very stiff Wilkinson blade that came with some Fencing and Gymnasia swords/parts I aquired on ebay several years ago. I always viewed it as a sword version of a T cross section girder. On closer inspection it could easily be a very acute angled isosceles triangle with the base extending beyond the sides. Does this correspond to the Triangled blade you are discussing. What a great assembly, John! (Congratulations on that Percy!) I think this is the first time I have seen each blade type in a side-by-side comparison. It is quite informative to be able to compare the dimensions of each example. I will try to add a bit to this thread comparison-wise as time permits. Last edited by J.G. Hopkins; 06-07-2010 at 07:13 PM. I've never seen one, but I envisaged a thinner section, almost like a fencing sabre. Yours is very unusual too, though! It looks to me more like a shortened T section 1904 Cavalry type blade. The Triangular blade Rifles sword I referred to above was Triangular in section similar to an Enfield or Martini socket bayonet. Where would a general's scimitar blade fit under those categories? The Percy blade appears to be the standard blade for the brass hilted HAC special pattern sword from the Victorian period. is that the case? This is one which although flat sided, doesn't quite match any of the above, and at best, might be given the description of Tulwar in terms of its actual shape and style of sharpening. Having looked at various examples on OldSwords, I'd agree! Wonder which came first? It's closer to the "Solid" than Robert's description of the triangular blade suggests, but maybe there's a case for creating a separate type just for this - the latch-back makes it different from, for example, the "Solid" P1821 illustrated in my first pic. Nice one, Gordon! Does this one have a fishskin grip or something else? It is a pre 1854 sword which has pressed laminated leather grips with the Reeves style solid tang. Here is one of the most unusual blade shapes. It never appeared to have a name but as associated with one man, Colonel King Harman, a name well known to aficionados of British Military Swords. The man, as Chief Inspector of Small Arms during the 1885 Sword Scandals, calmly and neatly pushed all the blame on the luckless Colonel Arbuthnot, Superintendent of the RSAF Enfield. In 1886 King Harman replaced Arbuthnot and it was then he probably decided that the Superintendent of the RSAF should have his own sword pattern and this sword was made for him on 4th December 1886. The blade description on the Proof Stub is worth reading! The blade seems to be a cross between a Small Sword blade and a Colichimarde style blade but 'modernised'! I find no mention of an affiliation with RSAF. Perhaps he thought the sword an appropriate distinction for himself as an early winner of the DSO, the DAQMG Intelligence, Bengal, or maybe the best explanation is that officers of the Indian Army often bucked the regulations. Here are two entries from Hart's List which illuminate his career which are hopefully of interest. Last edited by J.G. Hopkins; 06-10-2010 at 10:46 AM. I once saw a medieval sword replica for same in a store, and the salesman said it was a Wilkinson. Did they ever make replicas of medieval blades? I find no mention of an affiliation with RSAF. Perhaps he thought the sword an appropriate distinction for himself as an early winner of the DSO, DAQMG Intelligence, Bengal, or maybe the best explanation is that officers of the Indian Army often bucked the regulations. Or maybe it was a regimental pattern, or the two men were friends. Either way, this is their connection. Last edited by J.G. Hopkins; 06-10-2010 at 10:54 AM. They certainly made the shape of blade you describe for presentation , commemorative swords etc but ALWAYS etched with their name and no copying of medieval designs on the blade so as to fool anyone. In Victorian times, Wilkinsons did make some medieval swords when tournaments,etc and love of this period were all the vogue BUT again, they were always etched on the blade with Henry Wilkinson, Pall Mall, London. So if it was made by Wilkinson, it would say so on the blade. There seems to be tribes of King Harman's about in the Military and even navy at this time. But there is obviously a family connection if nothing else. Thanks for your sterling research Jonathan. M.J. King-Harman became Lt.-Col. of the 2/4th Gurkhas in October, 1886. W.H. King-Harman was an officer of the Royal Artillery and was promoted Col. in August 1886. 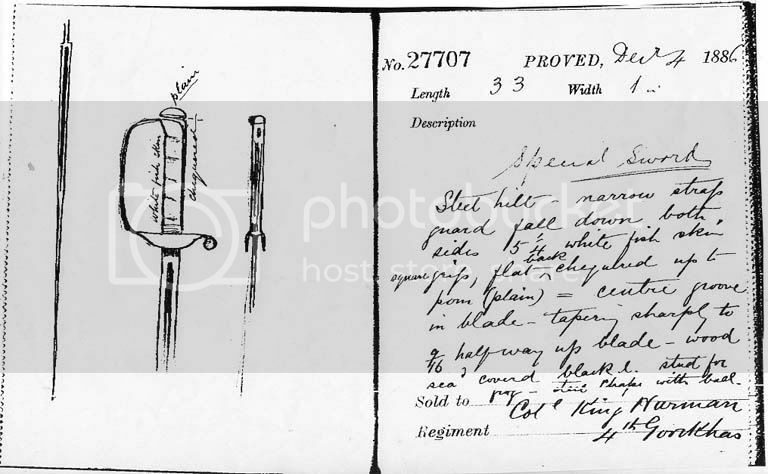 Based on this I am inclined to think that M.J. is the purchaser of the sword pictured above, and that the 38th Bengal Infantry is the connection between him and Dun. Last edited by J.G. Hopkins; 06-11-2010 at 05:48 AM. I agree with you. I think that many years ago at Wilkinsons when myself and John Arlett unearthed this sword in the 'Junk Bin- Old Swords, blades, hilts. 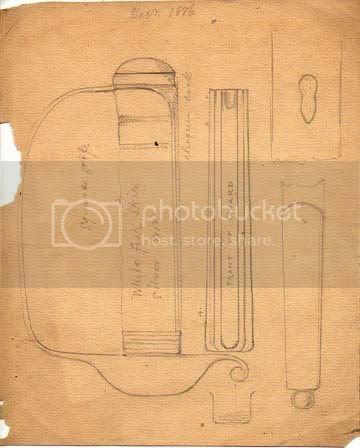 scabbard mounts,incl scroll hilts, 1822 hilts etc etc etc kept for replacement parts ) the only King Harman we knew about twas the one involved with Enfield so naturally we made the connection. It is obviously wrong and I thanks you for setting the record straight.